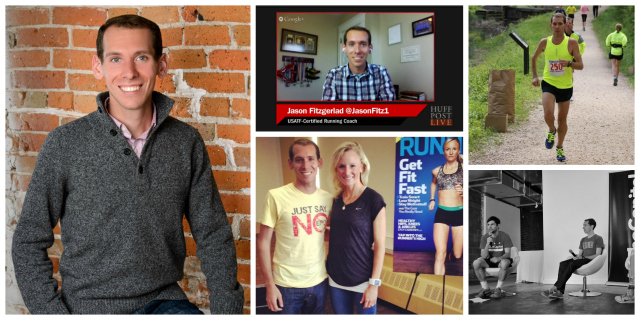 In addition to his blog, Jason has a great FREE online course on Injury Prevention that can help you avoid many common injuries. Over the years I have learned that a little daily strength and flexibility work goes a long way to avoiding weeks of Run Jail and excessive Physical Therapy. Please check it out! Okay…on to the interview. Enter Jason! Q1. What injury scares you? I’m most scared of IT Band Syndrome because it sidelined me for six months after my first marathon. It can be a stubborn injury, so treating it quickly and effectively as soon as possible is critical. Q2. What exercise do you think is the single most valuable one all runners should do? Hard question! There are so many, but basics like squats, dead lifts, and lunges (the basics) work great for runners of all abilities for developing strength. Q3. How did you develop the preventative mindset as a runner? I was chronically injured for a large period of my running career. Watching my fitness go down the drain when I loved running got old – so I prioritized injury prevention as a top goal and was able to stay injury-free for longer than I ever have before. That allowed me to set numerous annual mileage personal records, win a Warrior Dash obstacle race, and lower my marathon best to 2:39. Q4. The best running-related thing you’ve purchased for under $100? A Thera-band. For like $12, they make most exercises more difficult. And they’re travel-friendly! If you’re ready for more, a medicine ball is a great strength tool and they’re quite affordable. Q5. What type of cross training do you recommend for runners? For aerobic cross-training, cycling and pool running are the most specific to running (warning: pool running is boring as hell). Strength training is also critical, but I don’t even consider that “cross” training. It’s just part of training for runners. Q6. How do you warm up for a treadmill run vs a regular outdoor run? Running outside vs. inside on a treadmill are so similar that they don’t require different warm-ups. After a dynamic routine (my favorite), I’m ready to go. Q7. What warning sign do runners ignore the most? Q8. Where can folks find and follow you online? The best place is at Strength Running – or for bite-size nuggets of running wisdom, follow me on Twitter.